The Syracuse, New York-based author published a book to help readers understand the biblical doctrine on dreams and visions. People who read this book will be visited in the night by God and experience spiritual dreams. Although this book is based on the Bible as its course of validation, it is not written exclusively to the religious sector of society. This book is for everyone. The reason it is of value to all people is that God speaks to all people by way of dreams. The Bible itself not only declares this, but has on record many instances throughout biblical history in which God has actually done it. The fact is, God has spoken in dreams as much to those who don’t practice the most common format of religious beliefs, as to those who do. But it is unfortunate that many of these presentations have not produced the intended objective, neither in the secular or religious arena. Once you read through the first section of this book, you will have all the education needed to understand the biblical doctrine on dreams. In this way you will be aware of and equipped to benefit from a God-given dream if HE should happen to send you one. Lest, without this knowledge, a blessing, seemingly in disguise, would be lost. Discover God’s message in dreams and visions today. 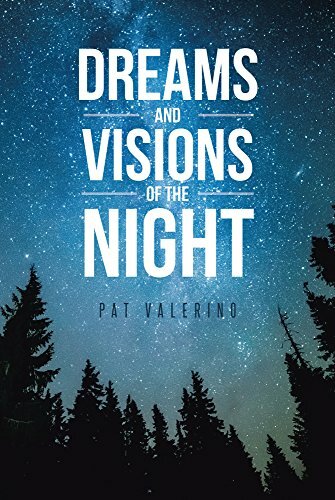 Order Pat Valerino’s “Dreams and Visions of the Night” through Amazon and Barnes & Noble. Await the public display of this book at the upcoming Los Angeles Times Festival of Books on April 13-14, 2019 at the University of Southern California in Los Angeles, CA. Publisher | Christian Faith Publishing, Inc.